A trip away to Lake Nagambie, a well-kept secret jewel in North East Victoria and only just being discovered by serious visitors to this magnificent region well known for its top wineries, thoroughbred horse breeding nursery and some of the best eating places can only be complimented by having the best accommodation possible for those discerning visitors and this is where The Jetty located on the waterfront at Lake Nagambie will answer all of your needs. Heavenly surrounds can only be complimented by the best accommodation, luxury awaits you in all 9 apartments at The Jetty, views to die for of the lake, plush linen and the very best of attention to your needs are the first things you will notice about The Jetty. 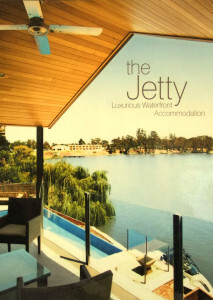 The Jetty is your destination for that fabulous weekend away or holiday away from the big smoke and the stress of big city life, life is casual and friendly once you reach Nagambie. Perfectly located to please your every need there is just so much to do once you have booked in to your comfortable apartment and leave your worries behind to get ready to taste and visit the local drawcards. Birthplace of the World Champion sprinter Black Caviar, Nagambie is well known on the tourist trail now for the magnificent statue of the mare built right on the waterfront only meters from The Jetty where you can have your photo taken with Black Caviar with Lake Nagambie as a backdrop. Within 15 mins away you can wine and dine at some of the best wineries available, Mitchelton, Tabilk, Plunketts, Bank Street Pizza at Avenel, not to mention the Longwood Pub, Ruffy Produce Store, and some of the best dining in Nagambie itself with mouthwatering bakery’s, hotels, Thai restaurant and many more local eating establishments. Whilst at The Jetty you can pop up to Shepparton only 30 mins travel to do some serious shopping, catch a movie, visit the trots, play golf, ten pin bowls or whatever your heart desires. Speaking of golf, don’t miss a game at the nearby Nagambie Golf club located right on the edge of town and if you are visiting through winter you can also watch the local Nagambie football club in action, always a big game. 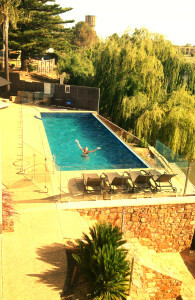 There is just so much to do and see whilst you enjoy your luxurious stay at The Jetty and if you don’t want to wander too far a dip in the horizon pool right outside your room on a hot day with a nice glass of wine is not to be missed, whilst you while away the hours with a view over the lake it’s activities and a good book. Can’t think of anything better myself! Copyright © 2014 The Jetty . All Rights Reserved.